In the spirit of full disclosure, my Dad has never actually allowed his granddaughter to commandeer his beloved ’31 Packard, but he has let her sit in the drivers seat a time or two. In the Spring Semester of her Freshman year of high school, Emme began taking Driver’s Ed through Florida Virtual online classes. I had been hiding my head and dragging my feet about the fact that she turned 15 and could take the class and potentially get her driving permit. She wasn’t pushing it until a few months after turning 15. The instructor told me it would likely take her 8 to 10 weeks to complete. She did it in 4. With an A. Why can’t that happen with Math? And when she wanted to go take the written test I said “ok” knowing that many of my friends had kids who had to take the test 4 and 5 times…. She passed it the first time. Then it all got real. Fast. 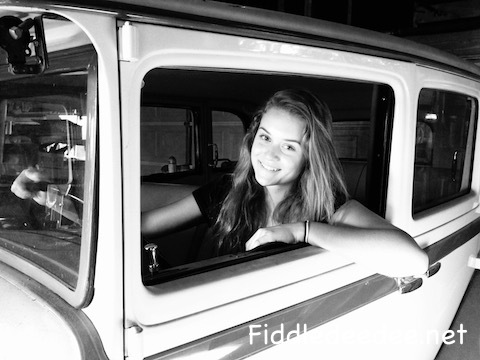 Right out of the gate I informed Fiddledaddy that since I taught her how to read, it was only fair that he teach her to drive. The first few driving lessons went well (I only know this because no one died) and eventually I took a valium and sat in the passenger seat of the van while she steered a two-ton vehicle down the road at a rate of speed that would make it difficult for me to jump out if I felt the need. Her 16th birthday came and went and she was content to hold her permit and not go for the license yet. In the state of Florida, you have to have your permit for a full year before taking the actual driver’s test. We’re now past that. And she’s turning 17 in a few months. SEVENTEEN. She did discover that she might have a little bit more work to do. A few weeks ago, Fiddledaddy came in looking a tad disheveled. It seems he had to grab the wheel to avoid certain collision. Me: “She knows how to set the mirrors.” That’s the first thing she does when she gets into the drivers seat. I take comfort in that. At dinner tonight, Cailey casually mentioned that she will be turning 15 in a few months and was looking forward to taking Drivers Ed. I look forward to hyperventilating in the corner in a fetal position. I am enjoying seeing you write more again! Having been through this twice with my 21 and 18 year old, I totally feel your pain. My oldest was so cautious and never wanted his license. We had to force him to go through the process every step of the way. My 2nd son? Total opposite, but we held him off till he was well past 16 to get his permit. After a few lessons with him, I asked him how he felt about crossing a major street. He said he felt great. So, I told him to turn right and go up to the light to cross over Main Street. Well, he thought that since I told him to turn right, he could just go for it without looking, and here comes a car down the street! Fortunately, it was a very small, slow street, and the guy stopped in plenty of time, but I shrieked and my heart dropped! That driving lesson ended right there and then! He is now a very careful driver, but he has always been my child for whom attention to detail is completely unimportant. We have had to drill the importance of paying attention to every detail when driving so that he will return home in one piece. Taught my sister to drive using a ’65 Volkswagon bug with four on the floor. She couldn’t turn and shift at the same time and we jumped a curb and barely missed a light pole. When it came time to teach my son to drive, I did so in a shopping mall parking lot on a Sunday morning, in a car with an automatic transmission. HA! My daddy taught me in our ’61 Lincoln Continental. Classic. During a lesson, I made a left turn. Forgetting to turn the wheel back. Took out a guide line and power pole, knocking the lights out in an entire subdivision. That’s a post in itself. Driving back from taking my driver’s test at 16, my mom in the passenger seat, I attempted to turn right from the left lane, in traffic, resulting in screeching tires and numerous horns, but fortunately no crunched fenders. Hahaha! I can laugh because I taught all 3 of my girls to drive and I’m officially retired as a driving instructor. I will pray for you! 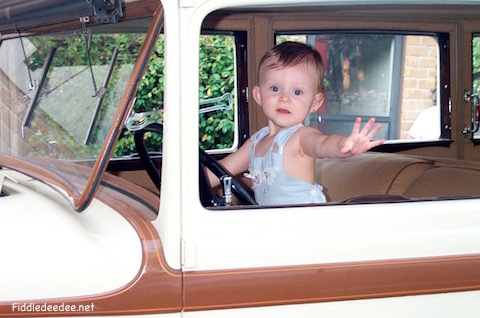 It does get easier to ride shotgun while your children drive (well…depends on the child ;). My 21 year old and I just did the drive from Chicago to Philly and she drove the ENTIRE WAY while I read 1.5 novels and napped. It was wonderful! I raise my cup o coffee to you enjoying being driven to and fro by the ones you have had to play chauffeur to for years!! I taught both our kids to drive. One has never had a ticket, drives like Grandma Moses. The other? By 22 had totaled two cars and seriously damaged another. So, who knows…. Story you can appreciate-I learned to drive at 11 when we lived in farm country. Then we moved back to LA. Dad and I spent many a happy hour with me (illegally) driving the bac roads of Acton and Aqua Dulce. One Wednesday night, after Church youth group, he did not feel well (it would later turn out yo be the first of four heart attacks! But not my doing and just a side note). So, he had me drive home from church. Picture this from your fetal position- 12 years old, station wagon, Van Nuys to Valencia, via the 405, 5, 14. To this day, my mom has NO idea that fever happened. I learned in part on grandpa Tomerlin’s Tractor, plowed several feet of the Farm to Market between the cantaloupe / watermelon field and the house before he got me stopped! We didn’t tell grandma or my mother cause it would have been “too wet to plow” then. Dorothy taught our girls, thankfully I was very busy at the Shipyard. Send them down I have a big old tractor and a Private Road they can practice on.